The mission of this committee is to propose the directions that Open Science should take and to teach the subjects on questions of Open Science, as well as to animate and accompany the actions associated with it, in a fluid structure that simplifies the expression of ideas, suggestions and contributions, and their transmission to the different working groups. To accompany the development of Open Science in a dynamic fashion and to co-ordinate it on the National, European and international scale, the plan of the Digital Scientific Library (BSN) has evolved, and it has been transformed into the Committee for Open Science. To propose all actions likely to strengthen or promote the access to knowledge or research data to ministers of higher education and research and all public authorities. 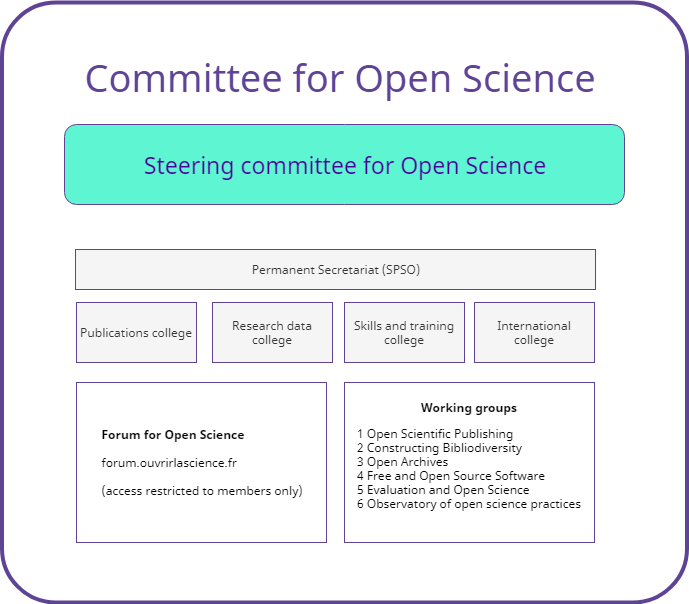 The Committee for Open Science is equipped with a steering body, the steering committee for open science, and a technical committee to ensure the articulation between steering, the groups, and the forum. The president of the steering committee for open science is the Chief Executive Officer of research and innovation (DGRI). those in charge of steering the colleges. The leaders of the working groups will be invited according to the subject to be discussed. The permanent secretariat is also in charge of the ouvrirlascience.fr website which features news on open science and the working groups as well as a library of essential resources on open science. It also disseminates the public opinions of the Open Science Committee. The permanent secretariat has an office made up of of the Advisor for Open Science, the head of the higher education and research strategy coordination department and the assistant director of strategic steering and territories. The composition of the colleges and groups, their missions and projects, as well as their deliverables are accessible from the Group tab. More than 200 experts took part in the forum for open science, a space for discussion, sharing, and construction of a common skill set to enable sharing and to contribute to instructing the Committee for Open Science about the complexity of scientific, technical, documentary, economic, and legal stakes. The forum of Open Science lies at the heart of the Committee and allows the teaching of subjects to prepare questions arbitrated by the Steering Committee of Open Science.